OXFORD, Ohio – Just a microcosm of the season. Miami was every bit as good as Minnesota-Duluth in the first period but found itself down two, then four in the middle frame as the Bulldogs eventually went on to win, 5-2 at Cady Arena on Saturday. An unlucky bounce for Miami – or a lucky one for UMD, depending on your perspective – resulted in the Bulldogs’ first goal. Poor coverage in the slot ended up in Nos. 2 and 3, and as has been the case so often this season, those were two of the only breakdowns in front of the net for Miami (6-11-3), and the puck ended up in the back of the cage. A bad play by senior goalie Ryan McKay made it 4-0, and that was essentially the night. With past teams, a four-goal deficit would be a huge uphill climb but not insurmountable, but this RedHawks team has scored four goals in a game once, and the final tally in that contest was into an empty net. This loss was crucial because Miami had a chance to pull within two points of UMD (8-7-4), which is in third place in the NCHC. Now the RedHawks are eight behind the Bulldogs. Miami is now at the halfway point of its league schedule and has just 10 points in conference play, and earning two of six points this weekend made any ascent of the NCHC standings significantly more difficult. With three points awarded for each game, 1½ points per game should put a team in the 4-5 seed range. That’s 36 points. Miami needs to win nine of its final 12 league contests to reach that mark, and the RedHawks would likely need more than that to catch the fourth-seeded team. All that comes back to the same axiomatic point: Miami needs to win more. – McKay was pulled after the fourth goal, and he was visibly angry while departing. He launched his goalie stick down the tunnel, and it hit the edge of the stands and almost made its way into the seats. He also yelled something while leaving the bench. McKay did not come out with the team for the third period, and he also was not on the ice for practice Monday. That almost certainly means Jay Williams will be in net this Saturday. Freshman Evan McCarthy is the team’s third goalie, so we’ll see on Saturday if he is elevated to backup status on the interim. – Miami ended its six-game power play drought as sophomore defenseman Louie Belpedio scored in the final second of a man advantage in the second period. 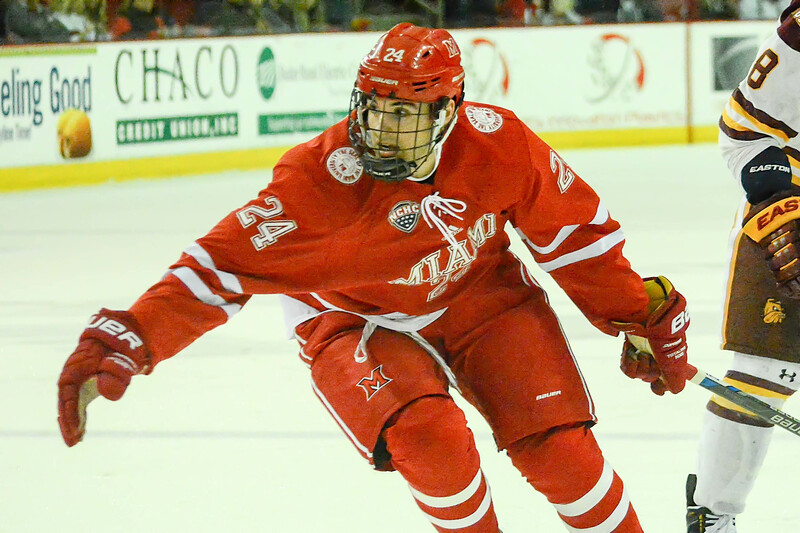 The RedHawks were 0-for-16 in their previous six games with two shorthanded goals allowed. – Let’s try to invoke some positives: For all of the problems Miami’s offense has had, senior forward Alex Gacek has one of the team’s best forwards in previous weeks. He is skating as well as he has his entire career and has been great in all three zones, although his points total doesn’t reflect that (it’s tough to pile up points when Miami scores three goals in a weekend). – And classmate and captain Sean Kuraly looks like he is close to breaking out. Even with his struggles on offense, he has been solid on defense and in the faceoff circle, and he has been more active in the offensive zone in recent games as well. Miami freshman Ryan Siroky scored his first career goal on Saturday (photo by Cathy Lachmann). FORWARDS: D. This corps managed just 10 shots on goal, and Miami had only six the final 40 minutes. Freshman Ryan Siroky, who is steadily improving, scored his first career goal on a laser from the outside of the faceoff circle, but that was one of the lone highlights for this group. Minnesota-Duluth did an excellent job of taking the Anthony Louis-Josh Melnick-Jack Roslovic line out of the game. DEFENSEMEN: C. UMD was held to just 22 shots, more than a dozen fewer than on Friday, and Belpedio found the net. Players were left alone in front of the net on the Bulldogs’ second and third goals, but it’s unclear without replay ability whether that blame lies here or on the forwards. GOALTENDING: C. McKay’s only real mistake was on the ENG after his bad clear on the fourth goal, and Williams was 6-for-6 in relief. With this team’s lack of offense, if the goalies’ grade isn’t a ‘B’ or better, Miami has little chance of winning. LINEUP CHANGES: Up front, freshman Kiefer Sherwood was scratched in favor of senior Michael Mooney. It’s unclear why Sherwood sat, since he seemed pretty solid on Friday. On defense, freshman Grant Hutton did not dress for the first time this season, and junior Colin Sullivan returned to the ice. Hutton is having a solid rookie campaign but did struggled on Friday, and Sullivan continued to play well in limited action. He has to be one of the top seventh defensemen in all of college hockey. Posted on January 11, 2016, in 2015-16, University of Minnesota-Duluth and tagged Alex Gacek, Louie Belpedio, Minnesota-Duluth Bulldogs, Ryan McKay, Ryan Siroky, Sean Kuraly. Bookmark the permalink. Leave a comment.